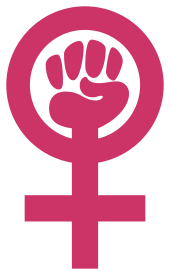 Liberal feminism marks an important approach to feminist politics which was especially pervasive during the first half of the Twentieth Century. Some of the most well known examples of liberal feminist writing were published far earlier, including John Stuart Mill's The Subjection of Women (1869) and Mary Wollstonecraft's A Vindication of the Rights of Woman (1792). A common theme of liberal feminism is an emphasis on equal opportunity via fair opportunity and equal political rights. In addition, according to the The International Encyclopedia of Ethics, "[L]iberal feminisms of both the past and the present retain some commitment to the distinction between the public and private realms – a distinction [which is the] focus of much critique within feminist political theory." Whereas Marxist feminism and socialist feminism considered classism as the primary source of women's oppression, radical feminism abdicated any previous forms of political theory to develop entirely new theories rooted primarily on the direct experiences of women. Radial Feminism, and its perceived impositions, created an anti feminist backlash starting around 2012. With certain women coming to the forefront to explain why the outdated ideas are no longer of use to them because of the already made advancements in the field of women rights. This field address how women lead differently than their male counterparts as legislators, executives, and judges. Some scholars in this field study how political leadership is itself masculinized to exclude the kinds of political leadership women most frequently provide, often outside of formal offices. For example, Hardy-Fanta looks at grassroots political work in Latino communities in the U.S. to identify feminized political leadership roles, ultimately concluding that Latina women provide the most critical leadership and work in those communities—despite the fact that most studies overlook their leadership because it does not occur within formal officeholding roles. 1 2 3 Watson, Lori (2013-01-01). Feminist Political Theory. Blackwell Publishing Ltd. doi:10.1002/9781444367072.wbiee757/full. ISBN 9781444367072. ↑ McAfee, Noëlle (2014-01-01). Zalta, Edward N., ed. Feminist Political Philosophy (Summer 2014 ed.). ↑ "John Stuart Mill: The Subjection of Women". www.constitution.org. Retrieved 2015-10-13. ↑ "philosophical feminism". Encyclopedia Britannica. Retrieved 2015-10-13. ↑ "philosophical feminism". Encyclopedia Britannica. Retrieved 2015-11-04. ↑ McDonagh, Eileen (2009). The Motherless State. Chicago: University of Chicago Press. ↑ Mansbridge, Jane (1999). "Should Blacks Represent Blacks and Women Represent Women? A Contingent Yes". Journal of Politics. ↑ "The Dispute Between Radical Feminism and Transgenderism". The New Yorker. Retrieved 2015-11-04. ↑ Young, Iris Marion (1994). "Gender as Seriality: Thinking About Women as a Social Collective". Signs. ↑ Hardy-Fanta, Carol (1995). "Latina Women and Political Leadership". New England Journal of Public Policy. ↑ "Politics & Gender". Retrieved 2015-12-11. ↑ "Signs: Journal of Women in Culture and Society". Signs: Journal of Women in Culture and Society. Retrieved 2015-12-11. ↑ "Feminist Theory | SAGE Publications Inc". us.sagepub.com. Retrieved 2015-12-11. ↑ "International Feminist Journal of Politics - Volume 17, Issue 4". www.tandfonline.com. Retrieved 2015-12-11.